California Department of Fish and Wildlife scientists say they've narrowed down the possibilities of the mystery gunk to a mixture of oils and fats. They still don't know if the substances are natural or manmade. "We've eliminated some of the suspect compounds including petroleum products, fuels, lubricating oils, hydraulic fluids, things like that," says state chemist David Crane. No word on how long it will take to make a final identification. Eight labs across the country are still working on the case and Crane says they'll keep at it until they "hit a wall." 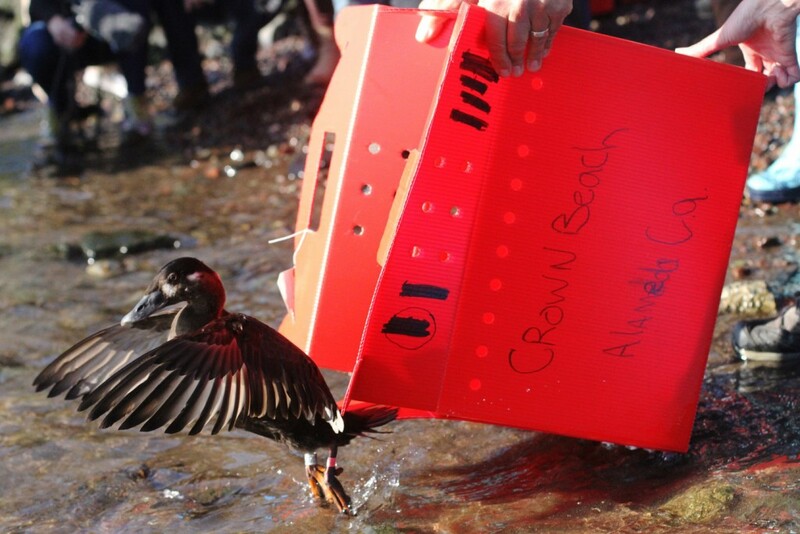 Excited sea ducks and shorebirds leapt into the water Wednesday as the International Bird Rescue Center released its third batch of water fowl. The birds started turning up San Francisco Bay in mid-January, coated in a sticky gray gunk. Three weeks later investigators are still trying to figure out what the mystery material is. It's not for lack of effort. State scientists, federal agencies, and a lab in Britain are all trying to identify the substance. To get a behind-the-scenes look at the forensic science involved, I drove to the state's Fish and Wildlife lab, to find out why it's taking so long. The lab's headquarters, a half-hour east of Sacramento, are completely unassuming. One paved road winds past discreetly marked stucco buildings: Petroleum Chemistry Laboratory, Water Pollution Control Laboratory, Aquatic Bioassessment Lab. Each lab tests for different types of chemicals and once you're inside, it's kind of a geek's paradise. Inside, various instruments click away, running simultaneous tests on the goo. 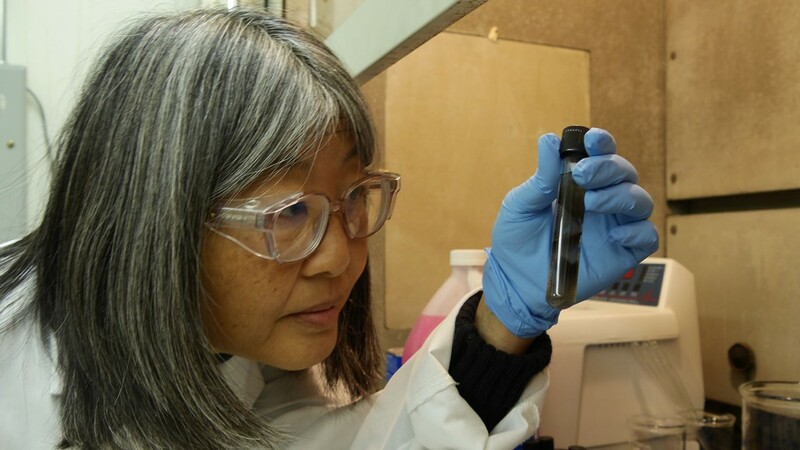 "They look a little bit like a microwave oven but with a lot more buttons," says chemist Gail Cho, who is showing me around, tossing out a dizzying stream of jargon. "And over here we’re standing in front of the gas mass-spec triple quad." That's short for gas chromatography mass spectrometry. It's a method for analyzing different substances within a test sample. The sample must be a gas and the device is able to identify trace organic compounds within the sample. Cho says, forget what you've seen on TV crime dramas. "A typical 'CSI' show takes about 40 minutes minus the commercials," Cho said. "A typical run for analyzing one compound like polychloride biphenyl takes almost an hour for one of them." There are 209 polychloride biphenyls, so that's nearly nine days just to clear all the varieties of one chemical. Moving on to another chemical could mean another nine days. After two weeks, working around the clock, you'd only have eliminated eliminate two chemicals. After cleaning gunked birds with baking soda, vinegar and dish soap, responders have released more than 100 back into the wild. That's the problem with an unidentified compound. Cho says investigators need some kind of starting point. Because even if they know what elements are in the compound, that's still only marginally helpful. "There’s a lot of things that have carbon and hydrogen but what is it?" says Cho. "Our bodies have that and most things in nature have that." Before Cho and her team can even begin the tests, they have to remove foreign matter like feathers and sand from the goo. Then they have to transform it into a liquid or gas, to run through the machines. "You’re basically trying to reconstruct a vase from a pile of powder," says Cho. She says in her five years at the lab, she's never seen anything like this. The Environmental Protection Agency and the National Oceanic and Atmospheric Administration are also perplexed, and working on the case. After three weeks, they've ruled out two suspect substances.